Certainly one of today's most popular and fascinating ornamental palms, this species was discovered as recently as the early eighties. Despite its recent discovery almost everyone in the palm world is familiar with this beautiful, but at the same time tough and adaptable palm. The Foxtail Palm grows a solitary, smooth, slightly spindle-shaped trunk that supports a full crown of the most beautiful, densely plumose fronds. It will grow successfully in all warm temperate and tropical climates and will even tolerate some light frost. 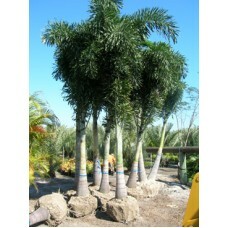 Foxtail Palms should be planted in Zone 10 or protected areas (micro-climates) in Zone 9.